If you’ve already started the search process, you know there are a lot of IT providers out there and a lot of questions you need to ask each of them. After all, you don’t want to entrust your precious technology in the hands of any old IT provider; you need a partner with which you feel confident can meet your business’ unique needs. Why should I choose your company as our IT partner? It’s always important to hear each provider’s pitch, but be sure they also discuss how long they’ve been in business, number of years they have provided managed IT services, accreditations they have received, and if they can share success stories that speak to their reputation. What does your service desk have to offer? You should align your business needs with the features available through each provider’s service desk. For example, if you need live help desk support 365 days a year with white-label branding and certain service level agreements (SLA), ensure they offer it. Also, how important is it to your company that service desk support be U.S.-based? How do you manage projects? If it’s important to you that your company receives a high level of customer service, you’ll want to enlist the help of a partner that offers a dedicated project management team, which utilizes a proven industry methodology and framework and is delivered by certified experts with the necessary credentials (e.g., ITIL, PMP). You should also consider the average years of experience of each of the project team members. What IT and program management strategy do you provide? Unlike more traditional ‘break-fix’ models of IT support, a managed solution aligns more with your business objectives. With IT strategy that is more proactive and forward leaning, you are able to significantly reduce costs over time. Also, consider if they provide automated systems management and maintenance with on-site escalation, as needed. IT is essential to running your business, so do your homework to find the right IT partner. 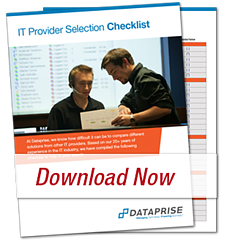 Download our interactive IT Provider Selection Checklist for a more detailed breakdown of questions to consider in your search for a new IT partner.